If you love voice messages on iPhone, or if you are required to record your voice frequently on your iPhone then this article will be going to help you a lot. In this article you will find how you can quickly access recording Options and how you can edit voice recordings easily. By default you will not find any lock screen shortcut to start Voice recording on iPhone. Voice recording app is inside extras folder on your home screen. But if you use it frequently then it should be in your lock screen shortcuts. So here is how you can add Voice recording shortcut to control center so it can quickly be accessed from the lock screen. Now head to Control Centre. Now add voice memos from more controls to the list of controls. Exit settings apps and you will see voice Memos in the control center when you will swipe up. This is how you can quickly start a voice recording from home screen or from the lock screen. Though you will need to enter touch id or passcode before starting recording but this way is quite simpler than accessing it from Extras folder. Once you are done with a quick recording you can exclude the part which is not required to do this you can follow these steps. Click on Trim icon given at the bottom right of the recording window. Now adjust starting and ending points of recording by dragging red bars to start and end point of the recording. Once you are done editing your recording, tap on Trim After a confirmation your recording will be trimmed. To save this edited recording tap on Done given next to the recording button. Rename your recorded file and tap on Your recording will be saved on your device. 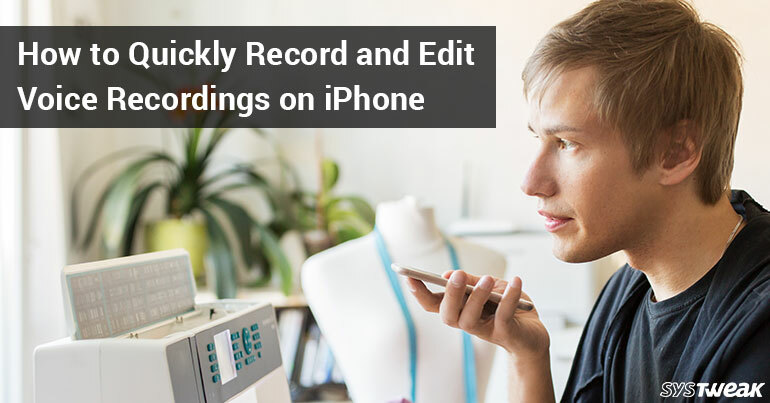 This is how you can quickly record and save voice recordings on your iPhone. Now you do not need to unlock your device first and then search for voice memos to begin recording. You can quickly start it from control center and can trim the non required part.